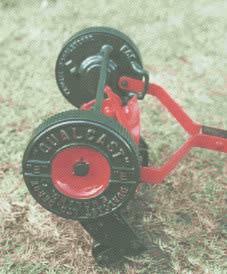 The sidewheel Qualcast Model E was introduced in the late 1920s, just a few years after the Derby-based company started to manufacture mowers. It became one of the most popular lawn mowers ever produced in the UK and remained in production until the 1950s. By that time, Qualcast claimed to have produced over two million examples. The Model E was originally introduced as a replacement for the company's earlier Model C machine. Its design was similar to most other sidewheel mowers of the period and there were no particular distinguishing features. Qualcast specialised in mass production machines and the Model E was soon a great success. 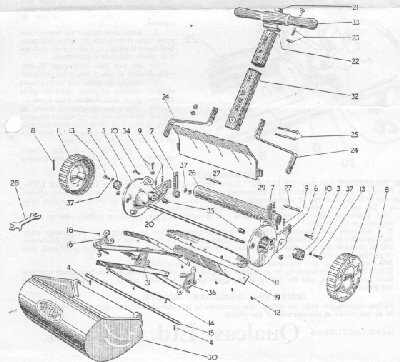 The mower was available in 8in, 10in, 12in and 14in cutting widths, although most surviving examples are the two smallest sizes. As with most mowers from that time, the grass box was an optional extra, costing a few shillings on top of the price of the basic mower. For a short period after the Second World War, only a 12in model was available. The first Model E machines were painted in an attractive red and blue finish. Later models were the more traditional red and green. The Qualcast Model E is relatively common today although the larger models and examples with the red and blue paint work are slightly more unusual.